It’s the time of the year when the young ladies are out shopping prom dresses. They’re looking for the one that matches their style and fit. Many start early to avoid the rush and have plenty of time to include alterations if necessary. Prom buying season will continue right up until the hour before prom. At Trendy Repeats, while all of our dresses are sold on consignment, some are new and some are gently used. The used dresses having only been worn for a few hours. We accept prom dresses for consignment that are the latest fashion styles and in good condition. The “latest fashion styles” meaning the dress was purchase new within the last 1-2 years and “good condition” meaning the dress doesn’t have stains, rips or tears. If the dress looks still looks new then it’s likely resalable. The bigger size dresses sell the best! We have lots of small size dresses. Those smaller sizes tend to sell the slowest. The larger size dresses tend to sell the fastest. Our pricing is obviously a great advantage as well. Our dresses are typically priced at 25% to 50% of their original retail price. For the ladies that bring their parents into the store and try on dresses we see parents thrilled when their daughter finds a dress priced for only $150 or less. We have a big range of prices on our prom dresses. Parents can consider their daughter’s happiness an affordable expense instead of a large investment. An advantage of shopping our dresses is that our dresses tend to be unique. We rarely have two dresses of the exact same style and color because our dresses are brought to us from all over the region. 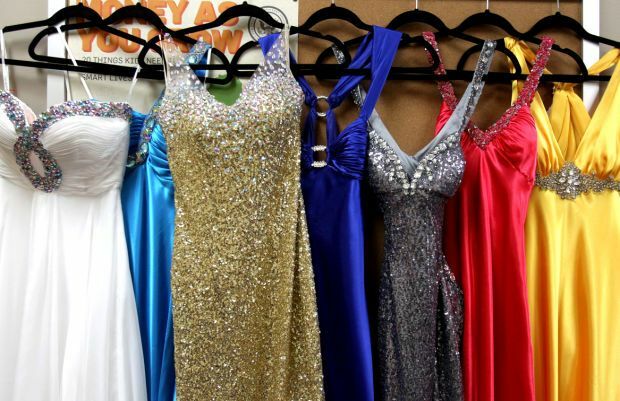 Our store serves as a regional hub for new and used prom dresses. We have young ladies that bring us their prom dresses from our local area of western Kentucky but also from southern Illinois, southeast Missouri and northwestern Tennessee. Prom dress shoppers that purchase new dresses from popular retail stores will likely find another lovely lady wearing the same dress. That often makes for an awkward moment. For the girls that don’t keep their prom dresses as a reminder of that wonderful night they can bring the dress back to the store for consignment. The dresses may be wearable for another season or two if they are kept in good condition, free of stains, rips or tears. Those dresses still have value in them that you can cash in. We accept dresses of all sizes and modern styles as long as they are still in good condition. We often have the unfortunate duty of rejecting some dresses because they have food or makeup stains. Some of the long dresses may have dirt or tears at the bottom where they were dragged across the ground. Another common problem is dresses with deodorant stains. Dresses that are ripped we might accept and sell for a greatly reduced price because not all of our dress shoppers are actually going to prom. We have some buyers that buy imperfect dresses for use in theater. The dresses that can be cleaned must be clean before we will accept them for resale. While many dresses can be cleaned with a wipe, some may need dry cleaning while some can be washed on gentle by themselves in your washer and then hung to dry. If you have dresses that are still in style and are in great condition consider bringing them to use for consignment. Sometimes our staff may have time to check the dress(es) while you wait but sometimes you be required to leave the dress. Before you leave you will be asked to complete the account paperwork. If the dress isn’t resalable the dress will be returned to you. Our store policy paperwork is located on our website here.